Bar Bar Black Sheep Classic Slot Guide & Review - Casino Answers! Bar Bar Black Sheep is a 3-reel, 1-line classic slot machine by Microgaming. Bar Bar Black Sheep includes special features including a wild symbol and multipliers. You can play the Bar Bar Black Sheep classic slot machine at Wild Jack Casino and Gaming Club Casino. Bar Bar Black Sheep gets its name from the English nursery rhyme Baa Baa Black Sheep. The symbols on the Bar Bar Black Sheep slot machine are sheep, bar symbols and wool (from the lyric “have you any wool?”). 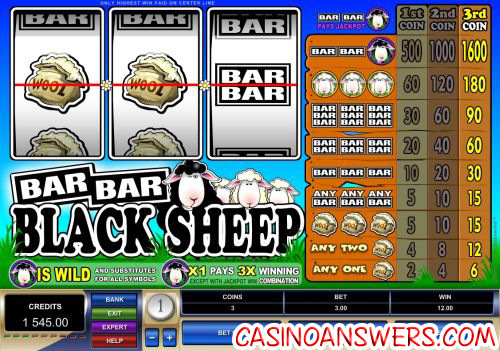 While playing the Bar Bar Black Sheep slot game, you can hear sheep in the background. To play the Bar Bar Black Sheep classic slot game, you must first set a coin size of $0.20, $0.25, $0.50, $1, $2 or $5. Now, you can either hit “Bet One” for 1-3 coins or hit “Bet Max” to play the maximum bet of 3 coins. The lowest total bet you can make on Bar Bar Black Sheep is $0.20 per spin, with the highest possible total bet being $15 per spin. To play Bar Bar Black Sheep, hit the “Spin” button. Bar Bar Black Sheep does not have a top jackpot symbol. Instead, to win the 1600 coin top jackpot, you must have the winning combination of Single Bar Symbol, Single Bar Symbol, Black Sheep to win. The Black Sheep symbol is wild and will substitute for all symbols in Bar Bar Black Sheep. One Black Sheep symbol will also act as a 3X multiplier except on the jackpot winning combination. The wild symbols are a great way to increase your winnings while playing Bar Bar Black Sheep at Wild Jack Casino. There are 9 winning combinations on the Bar Bar Black Sheep slot machine. They include (1/2/3 coin payouts in parenthesis): 1 Wool symbol (2/4/6), 2 Wool symbols (4/8/12), 3 Wool symbols (5/10/15), 3 of any Bar symbols (5/10/15), 3 Single Bar symbols (10/20/30), 3 Double Bar symbols (20/40/60), 3 White Sheep symbols (60/120/180), Bar/Bar/Black Sheep (500/1000/1600). Bar Bar Black Sheep’s jackpot winning combination is definitely something different from most online casino slot machines. To see if you can get the Bar Bar Black Sheep winning combination, head over now to Wild Jack Casino! How do I win the jackpot on the Bar Bar Black Sheep slot game? To win the top jackpot of 1600X your coin value on Bar Bar Black Sheep, you must hit the Single Bar symbol on the first and second reels, followed by the Black Sheep on the third reel. Where can I find a Flash game of the Bar Bar Black Sheep slot machine? You can play the Flash game of Bar Bar Black Sheep at both Wild Jack Flash Casino and Gaming Club Flash Casino. If you experience any issues playing the Bar Bar Black Sheep Flash game, make sure you have the latest version of Adobe Flash Player installed on your computer. Are players in the United States able to play Bar Bar Black Sheep for real money? Unfortunately, American players cannot play at Microgaming casinos for real money at this time. For a US-friendly RTG online casino with a lot of great slots you can play, please visit Winpalace Casino. Where can I play the Bar Bar Black Sheep slot machine? You can play this slot machine at Wild Jack Casino and Gaming Club Casino. For more details, please read our review of Gaming Club Casino.